Alexandria Ocasio-Cortez. Picture credit to: The Cut. 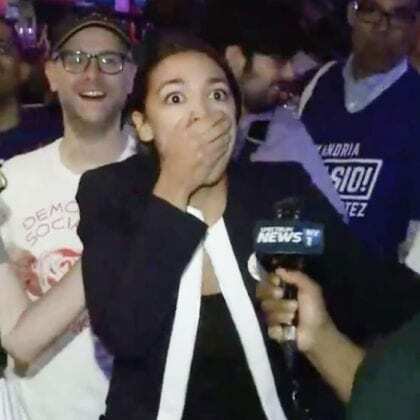 Alexandria Ocasio-Cortez (AOC) tabled a Resolution on the United States House of Representatives (H.RES.109) which hinted, in a first version, that “the Green New Deal would take care of people who are “unwilling to work””. That last bit of the sentence started a political hurricane in the United States. In that country, work is seen as tightly linked to jobs, and jobs are conceived as essential to value, and so “unwilling to work” is simply understood as “lazy”. Period. So, taking care of the lazy just sounds nonsensical to most Americans. Because most people and politicians in the United States equate “unwilling” with “lazy”, it’s very difficult to pass on the message that “unwilling” might actually mean unwilling to perform a certain job/task that can be revolting, disgusting, unfair, tedious, repetitive and/or badly paid. Rigid work ethics and years of living in an economic crisis has also helped to lower people’s expectations, and be more open to exploitation. What is at dispute, at bottom, is the nature of work. On the aftermath of those three words having been read on an official document, AOC was showered by a rain of criticism, particularly from Republicans, while being left isolated by colleague Democrats. Everybody fled, including AOC and her assessors. In an attempt to clear the record, AOC team tried to link it to the GOP, then alleged the release was a draft version. On the “final” version of the 109’th Resolution, cited above, indeed no reference is made to “unwilling to work”, or “unwilling” anywhere. Also, the reference to “basic income programs”, which was a part of a draft text for the Green New Deal that had already hit the news (for more positive reasons) was eliminated. So now, the creation of a Green New Deal, as proposed by AOC and some of her team and fellow Democrats, is completely devoid of references to basic income and unconditionality, while referring only to “universal access to clean water” and “universal access to healthy food”. And, on the H) paragraph of the 4th chapter, one can read the more fundamental and still core Democrats value as far as work is concerned: “guaranteeing a job with a family-sustaining wage, adequate family and medical leave, paid vacations, and retirement security to all people of the United States”. What remains to be seen is how AOC and other supportive Democrats envision achieving these universal rights – e.g. : access to clean water, healthy food and a decent income – without actually implementing a basic income in the country. Basic income supporters / activists say, however, that the unwillingness to work is one of the reasons basic income should exist. American philosophy professor and author Karl Widerquist says it eloquently: “This idea that somehow people who are unwilling to work are bad or lazy is a horrible idea. Because whenever there’s a job offer and somebody doesn’t want it, what you have is a dispute about wages and working conditions”. Andrew Yang, the American presidential candidate who is running his campaign on the basic income concept, said that, in fact, the language (“unwilling to work”) “is unfortunate. It does make it easier to try and portrait [UBI] as extreme”. Widerquist added that “It’s really horrific to use the threat of poverty and homelessness as a work incentive”, qualifying that as “monstrous”. However, it seems, the monstrosity hasn’t been enough to break the bond most Americans hold dear, between wealth and work. Senator Chris Murphy, on this issue, has stated that, although he thinks basic income is not sellable to the American public right now, the discussion about it should start today, because, to him, it will become a necessity in “decades” from now. In other countries, though, far away from the US geographically, economically and culturally, such as India, not only that debate has been going on for decades, but recent developments indicate that implementation of a basic income type of policy is on the verge of becoming a reality. André Coelho has written 267 articles. Activist. Engineer. Musician. For the more beautiful world our hearts know it's possible. I realize (to my, in my opinion, rightfully downlooking disdain) that most people don’t see it the way I do but I’ve never thought positively of how people equate “unwilling to work” to “laziness”, which is what this article encompasses, and then go ahead to use all kinds of different, positively-sounding words like “personal responsibility” to essentially describe a very disgusting, sociopathic idea: that anyone identified as “lazy” should be left to suffering and often death by destitution. Sure, they shouldn’t necessarily live like kings (you know, like the wealthy-on-inheritance-investment people that are perpetually ignored by temporarily embarrassed millionaires who oppose taking care of the lowest-ranked, such as with basic income) or at the same level as one who works and is rewarded properly. But really, anyone who sincerely thinks that laziness is a reason to leave people to freeze, starve, thirst or get sick to death, in a time of *increasing automation and abundance*, where people are very often motivated by luxury rather than death threats, no less? Those people are worse than sociopaths in terms of empathy, and should not be in control of ANY hierarchical structure without supervision that can stop their assaults on human life, let alone an entire country, with their death-and-decay causing morality. When you judge a society, judge it by the standard of life given to the weakest and lowest-ranked. If that standard is miserable and worthless, the society itself should be judged as miserable and worthless. May I suggest that at the end of 4th paragraph, “between wealth and work” be changed to “very existence and work” ? In the US, being “unwilling to work” is not an option. In spite of the fact that US job losses since the 1980s well-surpassed job gains, Democrats (Clinton administration) declared that “there is no excuse” for being jobless, and he ended actual welfare aid in the 1990s. One must work to obtain food and shelter to survive. US job losses since the 1980s have well-surpassed job gains, and we have no mercy on those who are left jobless. Obviously, people can’t “pick and choose,” but when a job requires more than a person can physically manage, they are listed as “refused job offer.” The overall life expectancy of the US poor fell below that of every developed nation, but this isn’t considered an issue of concern. It’s just the American way, I guess. I am baffled that AOC should make such a crass mistake as saying ‘unwilling to work’, and then ‘correcting’ that by ditching the entire UBI. Babies out with bathwater. I very much doubt there are swathes of people “unwilling to work “ Americans wrongly assume this. For one thing, food stamps and EAEDC/TADFC are not sufficient for someone to live and put food on the table, particularly if they have a child, The notion that a single individual with a child would be somehow willing and happy to accept $16,000 a year in welfare and not work is absurd. What can you do with that? I’d be so depressed I’d probably hang myself. There is no unemployment money to support those who haven’t worked and are looking for work, even their first job, unless it’s self funded. Even SSI and SSDI is very difficult to be approved for.. Compared to other countries I’ve lived in welfare benefits in American are incredibly stingy. has the biggest economy in the world. But really we could afford a universal basic income. . We have more than 40 billionaires in this country. Pharmaceutical Czars and HMO CEOs receive millions in kickbacks while televangelists pay no taxes. Where’s the outrage when it comes to them? It’s just a matter of priorities.